Sandra Lawson is a Rabbinical student, a sociologist, a weight lifter, bike commuter and a new lover of trail running and a vegan. She is passionate about fitness and Judaism and calls them the two loves of her life. She is the first African-American student accepted at the Reconstructionist Rabbinical College Rabbinical Program, and the first black queer student accepted at any rabbinical school. She really wants to make the world a better place and make the world a better place for Jews of color, queer Jews and all Jews. So first of all, I am 44 years old and I started lifting weights when I was 18, and have been lifting consistently since I was 21. In my 20s I became a power-lifter, and was able to pack on a ton of muscle and gain a lot of strength - often out-lifting a lot of men that I knew. In my mid-20s, I became a vegetarian and a Personal Trainer, and in my 30s, some friends persuaded me to enter my first bodybuilding competition. 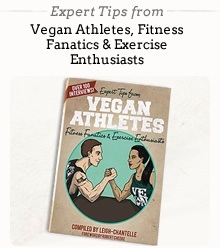 None of us knew anything about being a vegetarian and competing as bodybuilders. There was some information out there but not a lot, and all of my friends and fellow bodybuilders were all omnivores and so I acquiesced and started eating fish. I cannot even begin to tell you how much fish (mostly Tuna) and how many egg whites I ate for that first competition. Well, needless to say I got very bored with that diet and could not eat it any more of it. As my love of the sport of bodybuilding grew, so did my meat consumption and I threw out my vegetarian diet completely. I stopped bodybuilding to go to graduate school but continued to lift and eat meat. I continued my weightlifting regimen and working as a personal trainer and over the course of a few years my healthy diet deteriorated and I gained 40 pounds. I knew I needed a change and I felt like crap. I wanted to go back to being a vegetarian but for some reason I didn’t. Then one day in February 2009, I saw Rip Esselstyn on the Today Show and that changed my life. On the show, Esselstyn talked about being vegan and eating a strong plant-based diet and offered a 28-day challenge to try the vegan diet. I didn’t have any serious plans to be a vegan, I just wanted to follow his plan for 30 days and get back on track to at least being a Vegetarian. From February to May or June, I dropped 30 pounds and eventually lost over 40 pounds and I became a committed vegan. Although I became a vegan for vanity reasons, and health, I have since stayed a vegan for ethical, environmental and religious reasons. My health, my energy, I also feel more compassionate. I lift weights, cycle and run on trails. I lift weights about 4 to 5 times a week, run on the trails several times a week. Cycling is more like bike commuting. Not currently playing any sports. I think the biggest misconceptions are that vegans are weak and we don't get enough protein. I try to educate people about how muscle is created and that all food contains protein, and by eating a variety of food loaded with nutrients, I am getting what my body needs - including enough protein. My strength is my strength. I am proving that one does not need to eat animals or animal by-products to be strong and athletic. you are a vegan and how do you respond? The biggest question I get is, “How do you get your protein?” My answer depends on how the person asked the question. If they are sincere, I will be sincere in my answer. Lunch - Mostly fruit but maybe a salad. Dinner - Mostly salad or it could be something else. Snacks (healthy & not-so healthy) - Love vegan pizza. Protein - Spinach, kale, broccoli, beans. Calcium - Same as above. Iron - Same as above. Losing weight - Eat plants and lots of them and exercise. Maintaining weight - Eat plants and lots of them and exercise. Improving metabolism - Eat plants and exercise. Not sure if I am promoting veganism. People who know me, they know that I am a vegan. I think I provide a good example of how to be fit and without eating animals. They can contact me through my website, or on Twitter.